Miss Jane Hubbell Kinneson, the Mountain’s sole denizen, is our “Duchess” — a nickname bestowed on her by the half-admiring, half-cowed townspeople of Kingdom Common, located at its base. (Kingdom Common’s residents are called, appropriately, Commoners.) A retired school marm just turning 50, the Duchess seems to be everywhere at once, running the town’s combined library-bookstore (called the Athenaeum), giving historical lectures, projecting weekly silent films, carving award-winning sculptures from wood, and running her farm like it’s 1880, not 1930, with two oxen named Ethan and General Ira Allen. 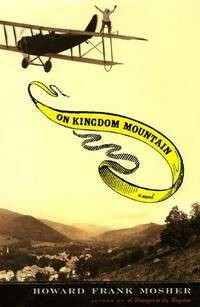 The novel finds Miss Jane mired in a dispute with her cousin Eben, the town lawyer and developer, who hopes to bring jobs to this backwater by cutting a road over the mountain to Canada. But Jane will not have it: Her mother’s mother was a Memphremagog Abenaki, and her Scottish father pledged to defend the mountain on behalf of its original inhabitants. And she can take on a lover. Jane’s dapper, fortysomething admirer, Henry Satterfield of Texas, enters the picture by crashing his yellow biplane at her feet on her 50th birthday in the middle of a March storm. The aviator confirms that he has landed on the same Kingdom Mountain about which his grandfather once told him a riddle — but topples over from a concussion before he can recite it. The riddle concerns the location of $100,000 in gold pieces stolen from the Kingdom Common bank during the Civil War. The novel’s prologue summarizes what is known of this incident, in which two Confederate soldiers carried off the loot. Henry’s grandfather may or may not have been one of them — just as Henry himself may or may not be Courteous Clyde, the famed Depression-era bank robber. In any case, the gold was never found, and Henry wants it. Jane may be able to lead him to the money— which, it is rumored, was buried on her mountain. As if that weren’t enough, there’s the small issue of Henry’s own Creole heritage — another reason mixed-race Jane doesn’t hesitate to take in the Southerner. Race seems like an incidental detail in this narrative, gratuitously carried over from Mosher’s Stranger in the Kingdom — but perhaps the author was thinking it never hurts to remind us that Vermonters are awfully white. Over the course of the novel, Jane comes to think of the hidden money as her own, even though she insists repeatedly that, had her grandfather found the “tainted” treasure, he would have returned it to the bank. This turn never seems quite justified, but it does help add conflict to the lovebirds’ relationship, which generally lags. Despite these efforts at realism, Mosher’s Depression-era Vermont looks like nothing less than a Grant Wood painting, imbued with a deep-green, agrarian timelessness. Those WPA photographs of Vermont’s failing farms, taken in the 1930s, were most likely not part of his otherwise extensive research. But Mosher’s penchant for timelessness is also strategic, allowing him to point to issues that continue to affect Vermont. The composite-sounding Kingdom Mountain, spanning the border near Jay Peak, is a tract of wooded wilderness threatened by development — an issue that defined the recent protracted battle over enlarging the Green Mountain National Forest. And the mountain’s “owner” — Jane — claims it was never part of the U.S. or Canada, much less Vermont. Secession, anyone? In a syntactically awkward touch, Mosher also makes “On Kingdom Mountain” the name Miss Jane has given to a room in her house that contains her wood-carved figures. Here she retreats to talk through crises with her “people”: life-sized representations of her ancestors whose names read like a list of New England keywords — Uncle Pilgrim, Grandfather Quaker Meeting, Great-grandfather Freethinker. Jane’s attempt to maintain her link to the past is much like Mosher’s own method of preserving a region’s history: Gather representations of its looming figures around you, mythical or no, as a bulwark against change. Wisely, Mosher does not deny that change is inevitable. But his message is clear: The more we appreciate — which is to say, aggrandize — the heritage of this remote corner of the state, the better chances we have of preserving it.